Last night, the NXNE Twitter account reported that “due to unnatural forces,” Bleached would be playing the Silver Dollar at 2am instead of their originally scheduled midnight. The privileges of being a “buzz band” means that you can still pack a venue at 2 in the morning. 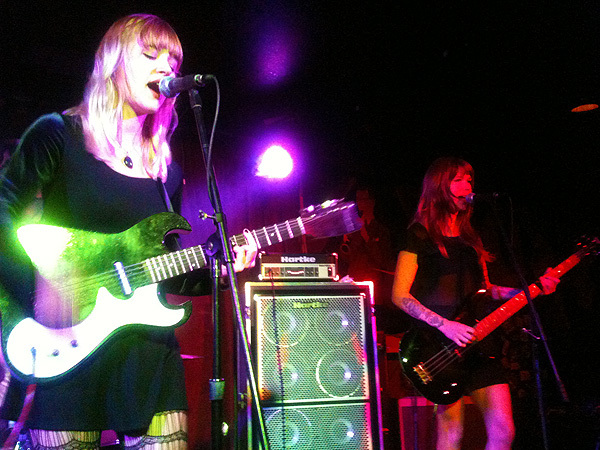 Hailing from Los Angeles, Bleached are sisters Jennifer and Jessica Clavin, rounded out by drummer Jonathan Safley and bassist Sara Jane Stevens. Often mentioned in the same breath as Best Coast, Dum Dum Girls and Vivian Girls – undoubtedly for the west coast connection and gender pigeonholing (women playing music isn’t a new concept, thank you very much) – Bleached as a live band are far more punk (or “rock ‘n’ roll post-punk” as their Facebook page states) and power chords than the other aforementioned bands. Their songs are raucous and straightforward, with a punk edge not unlike the Ramones. Their second last song was even a Ramones cover, during which Jennifer put aside her guitar to wail and dance around the stage. Judging from the audience cheers and occasional “I love you!” shouted by a smitten male fan (or fans? ), it was evident Bleached did not disappoint. For a 2am performance, Bleached certainly rocked out and I can attest – my ears are still ringing the day after.